Winner of the 1997 Advanced Technology Award, Cellfood is the cell-oxygenating formula that makes Cellfood Oxygen Gel the most nourishing, revitalizing skin care product available. It contains a wide array of ionic trace minerals, enzymes, amino acids, electrolytes and dissolved oxygen. But what makes Cellfood especially unique is its ability to ‘dissociate’ water molecules— weakening their bonds and releasing vital oxygen and hydrogen. This ability to release cascades of these precious building blocks of life has made Cellfood one of America’s fastest-growing nutritional products today. 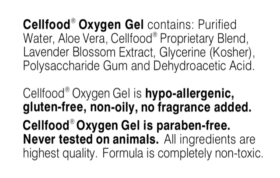 For persistent conditions: You may add 1 or 2 drops of original Cellfood concentrate to the gel for special skin problems. Don’t add it to the jar— rather, mix a drop or two into an individual application of gel. You may use cap or the palm of your hand for mixing. Gel will become more liquified. Note: A thicker layer of gel may be used for addressing the appearance special skin problems, and may result in some minor flaking as it dries. If applying gel first under moisturizer or makeup, using a thinner layer will prevent this. was specially formulated as a topical base to deliver Cellfood’s foundational support to the skin. Remember that adding Cellfood drops to your water will also support healthy, glowing skin.